A Hispanic man sitting sideways in his wheelchair with a service dog turns to look forward. According to the Americans with Disabilities Act (ADA) Compliance Guide for Nonprofits, people with disabilities comprise more than 19 percent of the people living in the United States. How are funders, non-profits and private sector organizations supporting individuals with disabilities in their communities? 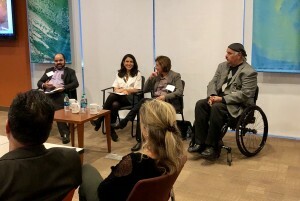 On November 28th, a packed house of these groups convened at the California Community Foundation (CCF) in Los Angeles for a panel discussion with leaders and allies of people and communities with disabilities. The event’s goal was to explore ways to provide access and opportunity for all regardless of ability in the LA area and beyond. A large group of people sit in chairs facing screens with colorful presentations. Carlos Benavidez, Artist and Chair, Los Angeles County Commission on Disability. He is the current President of the Commission and Chair of the Patient Advisory Council at Rancho Los Amigos National Rehabilitation Center (Rancho). Carlos’s passion for life and independence is shared with newly injured patients as a Peer Mentor with Rancho’s Know Barriers program. He is also an accomplished graphic artist and digital photographer and has exhibited his work in several art galleries nationally. Noorain Khan, Program Officer, Reserves Fund, Ford Foundation. Noorain makes grants that involve, among other things, economic, racial, and gender justice. Before joining the Ford Foundation, Noorain was Chief of Staff to Wendy Kopp, CEO and Co-Founder of Teach for All, and Founder of Teach for America. At Teach for All, a global network of organizations in 35 countries, Noorain worked with the CEO on strategic initiatives to facilitate coordination and deepen the network’s impact. Earlier, Noorain was a corporate attorney at Wachtell, Lipton, Rosen & Katz, where she advised clients on cross-border mergers and acquisitions and corporate governance. In addition, she represented clients pro bono in family law and Supplemental Social Security Income proceedings. Noorain serves on the boards of the Association of American Rhodes Scholars, Libraries Without Borders and Girl Scouts of the USA, where she is National Secretary and a member of the Executive Committee. Noorain has worked on the global public policy team at Google, as a contributing researcher at Jezebel and as a law clerk in the civil appellate section of the US Department of Justice. She appeared on the Forbes 30 Under 30 list for law and policy in 2014 and is a term member of the Council on Foreign Relations. Noorain earned a Juris Doctor degree from Yale Law School, where she was a PD Soros Fellow; an MPhil in migration studies from Oxford, where she was a Rhodes Scholar; her Bachelor’s degree from Rice University. Carmen Ibarra, CEO of the Achievable Foundation has more than 20 years of progressive leadership experience in the nonprofit sector. Prior to joining the Achievable Foundation, Carmen was the CEO at Pomona Community Health Center. She previously worked as Chief Operations Officer at Venice Family Clinic, which held the distinction of being the largest free clinic in the nation. Carmen is actively involved in the community and has served on several nonprofit boards, including the California Family Health Council, Westside Shelter and Hunger Coalition, and Health Care L.A. IPA. The discussion was lively and upbeat as panelists and attendees shared strategies and plans for going forward. Four people of different genders are sitting and facing a group for a discussion. WITH gives special thanks to our partners: California Community Foundation, Southern California Grantmakers, Ford Foundation, The Achievable Foundation, the Los Angeles Commission on Disabilities, and the L.A. County Department of Public Health’s Center for Health Equity for being a part this convening. We appreciate everyone who attended for their work and/ or interest in positively impacting the lives of people with disabilities in the LA area and beyond. 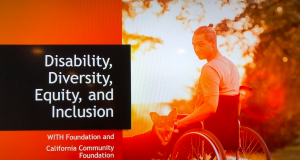 WITH Foundation hopes to facilitate many opportunities like this Disability DEI convening that bring together funders to discuss being intentional about including disability in grantmaking portfolios. These opportunities could also be funder-only conversations/events as well as one-on-one conversations. If you are a funder and want to continue the conversation about ways in which you can include the lens of disability in your grantmaking portfolio, please feel free to email FunderEdu@withfoundation.org. WITH would be happy to assist in these efforts.